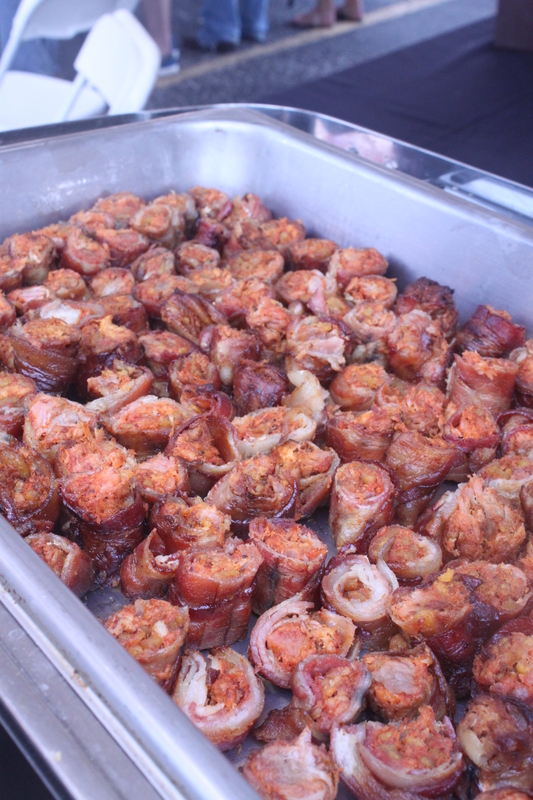 There are only a handful of festivals across the nation totally dedicated to the love of bacon. As we all know, Kansas City has the best barbecue, but what you might not know is that it also has the best Bacon Fest! This is one of the most fun annual events in Kansas City! And not only is it great fun, but is also supports a great cause. 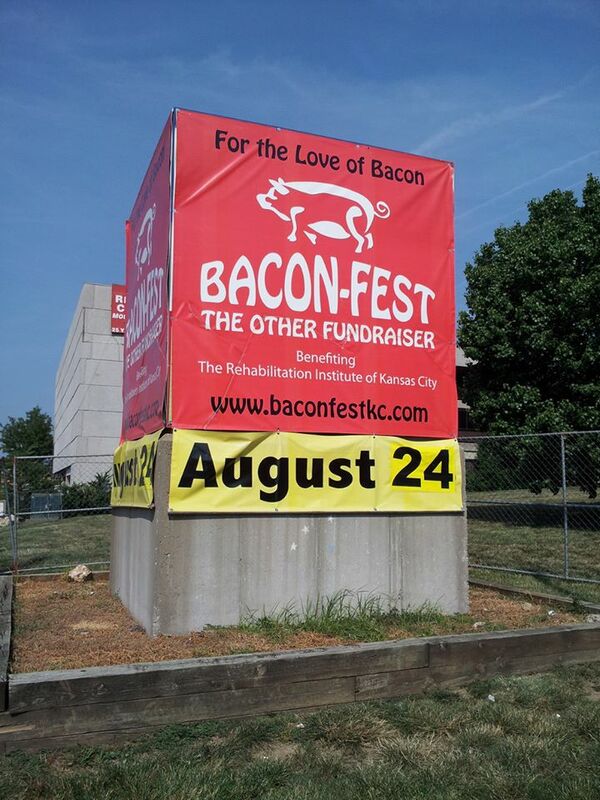 Bacon Fest: The Other Fundraiser is a fundraiser for The Rehabilitation Institute of KC. This wonderful organization provides physical rehabilitation services to youth and adults in the Kansas City area. A ticket to this year’s Bacon Fest got you a red plastic cup that could be used for all the Ameristar Casino micro brew beer you could drink, plus a sampling of bacon inspired dishes from some of Kansas City’s best eateries and caterers. Some of the delicious offerings included bacon brownies, bacon jam, bacon crème brule, bacon cheddar sausage and a whole hog! Numerous other bacon goodies were available as well. If that wasn’t enough, there was also a bacon recipe contest, bacon t-shirt contest and a bacon eating contest! The recipe contest was won with a fantastic looking bacon apple pie. The bacon eating contest was won by spunky military wife from Nebraska. She really showed the boys how to compete! As if this all wasn’t enough fun, there were two great sounding live bands and a shady relaxation lounge with fans and sunglasses sponsored by yelp.com. 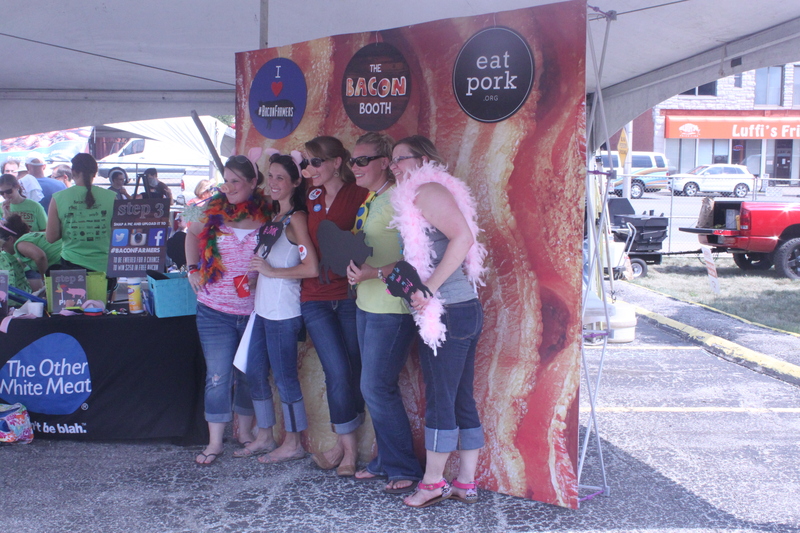 Kansas City’s own Farmland Foods gave away their bacon slice samples and the Kansas Pork Association had trendy “stay calm and eat pork” aprons and gave away $250 worth of bacon to one local photo booth participant. The KPA also sponsored the grand and reserve prize packages for the recipe contest winners. If there is any way to have more fun with bacon, I’d certainly like to know what it is! Be sure to put Bacon Fest on your agenda next year. You will not regret it. I bacontee it. Because you could win this book! 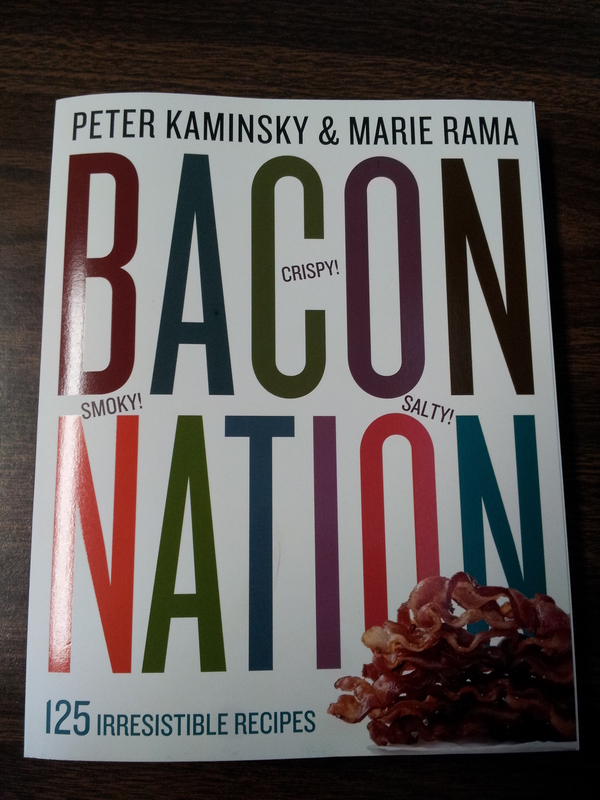 This recipe book has 125 “irresistible recipes” for bacon, but we want to know yours! What is your favorite dish to cook with bacon? It is the center of attention or the perfect garnish for that final touch? Leave a comment to let us know on this post. The contest will close on Tuesday, September 3, 2013 at 4:00 pm CST. A winner will be selected at random and notified via email, as well as announced in a comment on this blog post. The winner will need to respond to our email no later then Tuesday, September 10, 2013 at 5:00 pm CST to be eligible to claim their prize. If the prize is not claimed we will select another winner. Interested in more recipes for bacon?’ Head on over to our new site, eatpork.org, for recipes, coupons and more!